On December 9, 1927, at a session of the Polish Mathematical Society, Tarski presented several results that he obtained in the wake of Banach’s Partitioning Theorem (see Chap. 29). Apparently, what guided Tarski was his study of images of sets under relations and their relation to mappings of sets of sets, which continued section *37 of Principia Mathematica (see Sect. 39.6). In that same session, Knaster presented a fixed-point theorem for power-sets, which he had obtained with Tarski. The notes of Tarski and Knaster were published in 1928 (see Tarski 1928; Knaster 1928; cf. Tarski 1955 p 286 footnote 2). From the fixed-point theorem, Banach’s Partitioning Theorem can be derived. 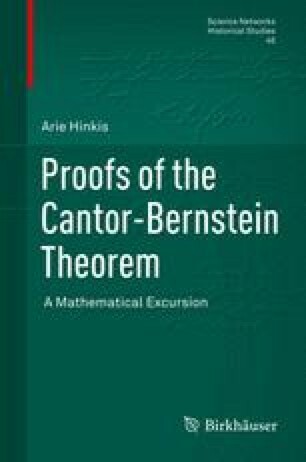 The fixed-point theorem was published without proof. The Tarski-Knaster notes grew within the Polish school into a research program. Cf. Szpilrajn-Marczewski 1939 and the bibliography there and Chap. 35.